2.1 This chapter provides an overview about the current status of the National Broadband Network (NBN) rollout, drawing on information from the nbn Corporate Plan 2017, Corporate Plan 2018-21 and other reports published by nbn. With particular reference to the Statement of Expectations, the chapter also outlines the evidence received about progress of the rollout, activations rates, and planning and prioritisation of the rollout. The Government is committed to completing the network and ensuring that all Australians have access to very fast broadband as soon as possible, at affordable prices, and at least cost to taxpayers. The Government expects the network will provide peak wholesale download data rates (and proportionate upload rates) of at least 25 megabits per second to all premises, and at least 50 megabits per second to 90 per cent of fixed line premises as soon as possible. nbn should ensure that its wholesale services enable retail service providers to supply services that meet the needs of end users. To achieve these objectives nbn should roll out a multi-technology mix network and build the network in a cost effective way using the technology best matched to each area of Australia. nbn will ensure upgrade paths are available as required. 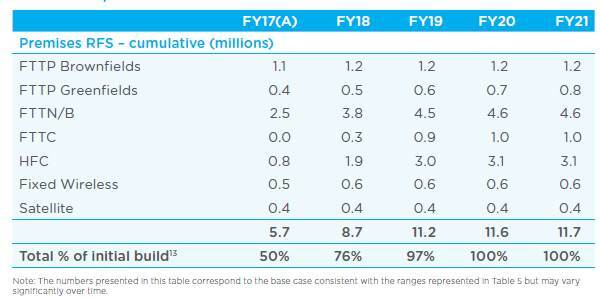 2.3 According to nbn's Corporate Plan 2018-21, nbn's key goal is to activate 8.6 million homes and businesses to the NBN by 2021, with a Ready for Service (RFS) footprint of 11.7 million premises. The estimated number of RFS premises by the end of FY2020 has been revised downward by 0.3 million from the figure included in the Corporate Plan 2017. In the government's statement of expectations to the company, the parameters that have been set—which the company is designing its network to comply with—are the delivery of 25 megabits per second to all Australians, and the availability of 50 megabits per second or more to 90 per cent of the fixed line network. They are the firm parameters in the statement of expectations. 2.5 It is interesting to note that in answers to questions on notice, nbn has advised that 35 per cent of FTTN premises are getting 50 megabits per second or less. If this ratio is extrapolated it will ultimately equate to 1.61 million premises and means that 15 per cent of the 10.7 million fixed line premises will receive 50 megabits per second or less. On that basis the network will not comply with the government's Statement of Expectations. 2.6 This forecast is based on an assumed take-up rate across residential and business areas by 30 June 2020 to be at approximately 70 per cent which is a greater take-up rate than is currently being met across all platforms. The Corporate Plan 2017 notes that full take up is constrained by factors such as: proportion of people requiring mobile-only products, vacant premises and fibre alternatives. 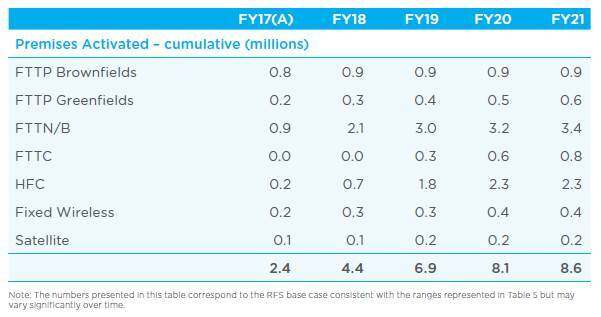 nbn also forecasts that beyond financial year 2020 (FY20), take-up rate will increase to 73 – 75 per cent. number of activations—premises where a customer has signed up to an NBN service. 2.8 This next section provides information about the status of the rollout, using RFS and activation figures as published in the Corporate Plan 2017, Half Year Report 2017, Third Quarter Results, Full year results 2017 and Corporate Plan 2018-21.
more than 600,000 premises activated. 2.10 The Corporate Plan 2017 included projections for rollout progress at the end of Financial Year 2017 (FY17) and until the end of the rollout in 2020. According to the nbn projections, a total 5.4 million premises would be RFS and 2.3 million premises activated by the end of FY17. 2.11 The number of premises RFS and activated would vary across technology type, as detailed in Table 2.1. 2.12 NBN rollout figures to the end of FY17 report that 5,713,000 premises are RFS and 2,443,000 premises have been activated. Figure 2.1 provides the cumulative RFS and activation figures for the 2014, 2015, 2016 and 2017 financial years as well as the projected figure included in the Corporate Plan 2017. 2.13 Figures 2.2 and 2.3 below provide the quarterly cumulative RFS and activation figures from the end of FY16 to the end of FY17 by technology. 2.14 The Corporate Plan 2018-21 includes projections for rollout progress for the end of Financial Year 2018 (FY18) and beyond. The number of premises RFS and activated would vary across technology type as detailed in Table 2.2 and 2.3. In terms of the rollout, the risks would relate to maintaining the run rate that the company has achieved. Over time, in order to reach its target of connecting all customers by 2020, the company has needed to increase the deployment rate it has achieved on a regular basis. It is now improving that run rate up to the point at which it is deploying to customers. Maintaining that high speed of deployment will be one of the key objectives of the company. 2.16 According to nbn, once an area reaches the disconnect date (that is, 18 months after it becomes ready for service), approximately 75 per cent of consumers able to connect to the NBN are connecting. The take up percentage is similar for FTTP and FTTN premises. At that point, a person who hasn't switched to the NBN would have no access to line broadband or an ADSL telephone connection, and could only be relying on mobile telephony and data. 2.17 However, at 30 June 2017, according to the Corporate Plan 2018-2021, there were 2.4 million activated premises out of the 5.7 million premises that are ready for service, which is an activation rate of only 42 per cent. 2.18 In the Full Year Results 2017, nbn reported the cost per premises for each technology for FY16 and FY17. 2.19 With respect to the cost per premise for FTTC, nbn advised the committee that the company estimates that the cost will be approximately $2,800-$2,900 per premise. 2.20 In meeting the policy objectives outlined in the Statement of Expectations, nbn is required to 'operate its business on a commercial basis'. Building a network quickly at a lower capital cost and bringing forward revenue has huge advantages not only for Australians getting a service sooner but also for the NBN in terms of the economics. We can use that revenue to fund future upgrades if and when the demand emerges. There is a lot happening there in terms of how NBN produces revenue. Certainly the rate of the rollout and the period at which people sign up and then start paying costs to their retail service provider and that revenue is then collected by the company is one factor. But at the same time the company is also developing new products, it is expanding the services it is providing into the business market, and also, as well as the level of activation increasing significantly, the other factor we are seeing is that there is more data being used by consumers and as a consequence more data that needs to be purchased by retail service providers. So the revenue per user is growing at the same time that the number of users on the network is growing as well. 2.23 In the Corporate Plan 2017, nbn reported FY16 revenue of $421 million which was a 157 per cent increase compared to FY15. 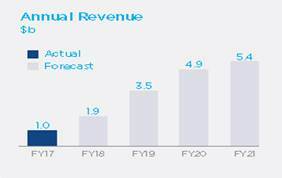 nbn also projected that by FY20, revenue will have grown by 12 times compared to FY16, as shown in Figure 2.5 below. 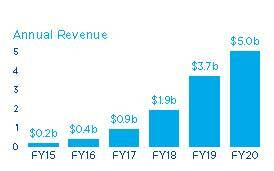 2.24 It is notable, however, that CEO Bill Morrow has publicly expressed concern about future revenue, and, in the Corporate Plan 2018-21 the forecast revenue for FY19 is revised down to $3.5b and the forecast revenue for FY20 is revised down to $4.9b. 2.25 The Corporate Plan 2018-21 provides updated revenue projections. 2.26 In the Full year results 2017, nbn reported FY17 revenue of $1,001 million which was a 138 per cent increase on FY16. Total revenue by quarter by technology is shown in Figure 2.7. Without having figures in front of me, I would venture to say FTTN would, because, the quicker the revenue comes on board it enables us to upgrade as and when consumers are willing to pay more because they need higher speeds. I think you've got to look at the full context of that. It would be silly for somebody to say that those two costs added together are cheaper, but it is an issue around where the cash flow management is coming from, or it should be. 2.29 Mr Morrow confirmed that nbn had not made provision for a network upgrade within the existing funding envelope. 2.30 The committee heard evidence from a number of witnesses to the effect that the cost-per-premise of FTTP has decreased by as much as 40 per cent in the course of the rollout in other countries. It appears the per premise cost that nbn attributes to FTTP has not changed since 2013. 2.31 Revenue projections with respect to upgrade pathways are discussed later in this chapter. 2.32 Figure 2.8 below shows the progress of the rollout by jurisdiction as set out in the Corporate Plan 2018-21. 2.33 Evidence to the inquiry described variations in rollout progress and technology composition across jurisdictions. Looking at that in percentages of the population terms and comparing it to the rest of the Australian population: 93 per cent of the population nationally has a terrestrial connection, and it will be 65 per cent of the Northern Territory population; three per cent nationally have a fixed wireless connection, and it is going to be six per cent in the Northern Territory; and four per cent nationally have a satellite connection, and it will be 29 per cent of our population in the Northern Territory. That means for us that 71 per cent of the Northern Territory's population will receive high-speed, high-capacity broadband services and almost one-third of Northern Territory residents will need to rely on satellite services in the future. As at 16 February 2017 (the latest NBN Co. roll out information), 597,203 premises in Queensland have been declared Ready for Service by the NBN Co. and 270,132 (45 percent) premises have been activated using FttP, FttN and HFC technologies. At 16 February 2017, 33 per cent of the premises covered by wireless in Queensland have been activated. The fixed wireless roll-out is reported to be generally reliable, and on, or ahead of schedule. The reported speeds are very close to what customers have been promised by service providers. At 16 February 2017, 16 per cent of the premises covered by satellite in Queensland have been activated. As of 23 June 2016, NBN has rolled out its FTTN and satellite technology to 54,123 premises around the ACT, and by January 2017 around 42,000 premises had active NBN connections. This is an increase of just 22,000 premises over three years since December 2013. While these connections are a mixture of FTTN and FTTP technologies, it has been determined that FTTN technology will be used in future ACT NBN installations. In a South Australian context, at the end of 2016, more than 308,000 premises had access to the NBN, of which 38 per cent (118,000 premises) have taken up an NBN service. While the take-up rate in SA is slightly lower than the national rate, it is pleasing to see that the rate of service availability in South Australia is on a par (32 per cent nationally versus 31 per cent in SA) with the national rollout after an initial slow start in this State. In the last few months, while the rollout has progressed in Western Australia, the take-up rate has dropped. From almost 42 per cent in April, it is now 39 per cent in July. In the same period, the number of homes rated as service class 0 has increased from 3.1 per cent to 4.7 per cent. Now over 23,000 homes are unable to get any services at all, and the number increases at around 2,000 homes per week. There were approximately 13.5 million internet subscribers in Australia at the end of December 2016. This is an increase of 4.7% from the end of December 2015. Fibre continues to be the fastest growing type of internet connection in both percentage terms and subscriber numbers. The number of fibre connections increased to more than 1.4 million connections, which is an increase of 122% in the year between December 2015 and December 2016. The total volume of data downloaded in the three months ended 31 December 2016 was 2.6 million Terabytes (or 2.6 Exabytes). This is a 23.3% increase in data downloads when compared with the three months ended 30 June 2016 and a 50.8% increase in the year between December 2015 and December 2016. Data downloaded via fixed line broadband (2.5 million Terabytes) accounted for 98% of all internet downloads in the three months ended 31 December 2016. Homes connected to services over the [NBN] are downloading around 144GB of data each month which is a 32 per cent year-on-year increase and around 1.2 times the national fixed-line average and 76 times the mobile average. 2.42 The committee received evidence from individuals and organisations about how they are using the NBN and the internet more broadly. Witnesses and submitters discussed activities such as internet banking, accessing government services, connecting with family and friends via social media as well as running a small business and completing school and university studies. The NBN is also used for entertainment and recreation services such as downloading movies (e.g. Netflix, Foxtel), and this is sometimes dismissed as an inappropriate or unimportant usage of the NBN. However, just as the use of road and transport infrastructure for the purposes of entertainment or recreation is completely acceptable, use of the NBN for these purposes can be an important social good. 2.44 The committee also received evidence that the community is increasingly using the NBN for uploading as well as downloading including: cloud based applications, such as accounting packages, agricultural and harvest recording as well as cloud storage. ... the State Library of Queensland, for instance, with its collections that it provides—that is different to public libraries—would be in the order of 90 per cent accessed online and digitally compared to using physical resources. It still means the libraries are very busy places where a lot happens, but accessing information happens, and people want it anytime, anywhere. 2.46 Further evidence about the utilisation of the NBN is discussed further in Chapters 3, 4 and 8 of the report. 2.47 Consumers signing up to a NBN service are required to choose a service based on the speeds available for download and upload. This option has not previously been available on ASDL services. Table 2.4 shows the plan speeds currently available and the take up rate across fixed line, fixed wireless and satellite (as at 30 June 2016 and 30 June 2017). People say they would be happy with 25 [Mbps]. Remember, 30 per cent of the people on the network are only are getting 12 and another 50 per cent are getting 25. And 25, typically, is sufficient for most. It was designed for a voice-based product in case somebody in a home says: 'I don't want to surf the internet over that network; I'll use my mobile device or nothing. I just want a phone service.' The 12-meg [Mbps] product was created for that. Now it's suddenly being used because it is cheaper than a 25 product, as this is your high-speed broadband NBN-enabled product out there, and I can actually have a lower cost because I'm only paying NBN $24 a month for this versus $27 to ratchet up to a 25 meg [Mbps]. When planning the rollout, nbn should prioritise locations that are poorly served, to the extent commercially and operationally feasible. During the rollout, nbn should be guided by the following goals: service quality and continuity for consumers; certainty for retail service providers and construction partners; and achievement of rollout objectives as cost-effectively and seamlessly as possible. nbn should apply the Government's new developments policy. 2.51 nbn estimates there are approximately 1.8 million premises that are underserved primarily located in regional and remote areas or in 'small pockets of poor service in metropolitan areas'. The nbn planning approach determines which technologies are utilised on an area-by-area basis so as to minimise peak funding, maximise speed of rollout, optimise economic returns and enhance the viability of nbn. The multitechnology approach provides the flexibility for nbn to select the most cost-effective and efficient technology for each area. This leads to a faster rollout, which brings forward revenue and minimises funding requirements. The anticipated technology to be deployed in communities may change depending on a number of factors during the design and construction phase, and also as new technologies or processes emerge. Some areas may be serviced by multiple technologies. 2.53 In accordance with the Statement of Expectations, the NBN rollout is providing broadband services using a suite of technologies. nbn announced in 2016 that FTTC would be included in the rollout. A FTTC trial has commenced in Coburg, a suburb outside Melbourne, to test the construction and installation of FTTC deployment. 2.54 Since first announcing that FTTC would be added to the rollout, the number of premises slated to receive this technology has varied. During the committee's inquiry, nbn advised that approximately one million premises would receive FTTC by the time the rollout was completed in 2020. The Corporate Plan 2018-21 says that FTTC will be delivered to 1 million households. 2.55 In the hearing on 1 August 2017, nbn CEO Bill Morrow acknowledged that a further 1 million households could receive FTTC for an additional capital expenditure in the order of $1 billion. The company makes decisions about how to prioritise the rollout of the network....it does that based on guidance from the government, where the government asks the company to prioritise underserved areas and to design the network with the objective of managing cost and making the most effective use of technology and its resources. We see a number of regions write to the company or write to the government to ask a similar question about why one region is prioritised over another. I think the company has said that it is not possible to prioritise everywhere first; there have to be some decisions made about the order in which the rollout progresses. NBN is currently installing FTTN networks in inner North Canberra as it is deemed 'not adequately served', even though these areas already possess NBN level internet speeds over the TransACT FTTN network. In comparison, parts of Canberra that receive internet speeds of less than 2Mbps are yet to appear on the NBN's rollout schedule. ...research indicates that a delay in NBN allocation for these areas will create increasing social and economic disparity compared to areas with priority access. For example, despite having some of the poorest broadband ratings in the country, ACT suburbs Monash and Theodore [in Tuggeranong] are not currently listed on the NBN rollout plan to commence construction prior to 2018. While some areas of TransACT have been purchased by NBN, the price of purchasing the entire network from TPG was not considered cost-effective. As a result, some areas of TransACT will be duplicated by the NBN network. As these areas already receive high quality internet connectivity, the resources for duplication would be more economically beneficial if reallocated to disadvantaged suburbs where it will provide a substantial upgrade compared to existing internet infrastructure. Ideally, I think they would like it done properly the first time, so they would be more than happy to wait if the service was at its best. They don't want a service to be rolled out that's going to have issues, where they cannot connect to their home line and it's worse than ADSL. That's not going to achieve anything, even though there are still lots of people with absolutely no internet. 2.61 The State Library of Queensland advocated for prioritising the NBN rollout to Queensland public libraries and remote and rural communities to 'enable economic development and create opportunities to improve digital inclusion and literacy...'. 2.62 On many occasions, the committee heard testimony about the balance to be struck between delay and the quality of the technology rolled out, with the prevailing sentiment being 'Do it once; do it right'. 2.63 Several witnesses highlighted challenges to access information about the rollout and explained that the timetable could be confusing due to the frequency of changes. ...I think a lot of them are looking at it from the point of view of: 'It will enable me to grow my business. I'll be able to transact more online. I'll be able to do more of this cloud based integration.' But a lot of them are obviously on ADSL, are hobbled and do not have a time frame, or it is X years out and the date keeps changing. A lot of them are disappointed: 'The date's changed three or four times now; I don't even bother checking it anymore, because I'm afraid to see what it's going to say my delivery time frame is now for my NBN services'. Limited information and communication from NBN Co has made it difficult to track the progress of the overall rollout of the NBN. Perhaps the greatest example of this is the fact that the full three-year rollout plan for the NBN was removed from the NBN Co website in December 2016. NBN's website is not particularly helpful in trying to get some details of what exactly is happening and when. It's fairly generic. I spent an hour or so looking at it last night just to refresh myself. There seemed to be more spin than substance in a lot of it. I understand it's probably a marketing tool in most cases, so you have to accept a bit of that. 2.67 The Statement of Expectations specifies that 'nbn will ensure upgrade paths are available as required'. Planning for upgrades to the network, with a particular focus on options to upgrade from FTTN, was discussed during the inquiry. There really isn't an upgrade path for FTTN, because the speeds are set by the location of the node towards the house. The speeds you can get on a copper line are dictated by the length of the copper line. The house isn't going to get up and move closer to the node, so the node has to get up and move closer to the house. So the upgrade process for fibre to the node is, effectively, to scrap the node, move fibre from the node further up the street towards the houses, and move into a fibre-to-the-curb type architecture, which is, essentially, a very small node DSLAM [Digital Subscriber Line Access Multiplexer] located in the pit at the bottom of the driveway with a smaller number of ports but a much smaller run of copper from that node to the house. Because the length of the line is short, you can get faster speeds out of it. For a fibre-to-the-node architecture, where the length of the copper run to a typical house is in the order of hundreds of metres—up to 400-odd metres before the technology becomes effectively unusable—there is little more prospect than anything more than a 30 to 40 per cent increase, at best, for people who are very close to the node if you were to change the flavour of VDSL [Very high bitrate Digital Subscriber Line] cards in the node cabinet from one flavour to another. At the end of the day, you are limited by the length of the copper line from the node to the house and unless you move one of those you are not going to get a speed increase. We have looked at every one of the five different access technologies that we are employing in the multi-technology mix. In each one of them is a way to increase the speed and the volume of capacity to run over that network. Each one of them requires some additional capital cost to be able to go forward on it. Sometimes additional fibre is necessary. Sometimes additional electronics are necessary for each of these. And sometimes it is even tweaking the parameters to optimise the capability. We do that across the board. There are a couple of variants in this. Firstly I think it is important to try and articulate the current architecture. From the big transit ring that is going around the nation that keeps the backbone there, fibre will go out to a neighbourhood entry point—and I'm over simplifying it for any of the techies who are going to want to make a point on this. At that point we stand up a piece of outdoor furniture, as we call it, which is a node. This is the cabinet that you see on the street. We run commercial power to the cabinet and we put electronics in it, which is the classic DSLAM for anybody who recalls that term. We then tap into the copper network that runs inside the house and we put a modem that decodes the signal that goes between that DSLAM and the house itself. The upgrade can come in the form of adding electronics to each side of that. As an option, there are a variety of G.fast, NG-fast and some other capabilities that are able to lift the speeds. Some countries—for example, BT has announced this in the UK—do a variety of these upgrades to get more speed out of it. On those I was referring to, not much. That is a potential upgrade on a case-by-case basis. The bigger upgrade is pushing fibre further down the street. We talked about the micronodes, and I explained how, if you push fibre further down, you have a shorter copper distance, which raises your speed, and therefore you can get more speed out of it. The old nomenclature of fibre to the distribution point, or fibre to the curb, is the most worldwide common terminology for that. That has a micronode, which is even more micro, that serves four to six homes. That is usually in front of or very close to one's house, and you have even more fibre and shorter copper loop links that then carry that signal and push that speed up. If you do an upgrade like that, when you put some G.fast electronics and some other technologies on it, essentially what we are talking about is that—what's the best way to answer your question on the 90 per cent having 50 or better? Take the four million homes that are slated for fibre to the node, with, let's call it, an average of 60 or 70 megabits per second, which is what we are seeing today. Those that are close to the node will have 100 megabits per second and those that are far from the node will have 25 megabits per second. The average of that is 60 megabits per second. But if you had fibre to the curb architecture in place, that would bump your average into the multiple hundreds of megabits per second. Holistically, no. But we are always looking...we are constantly asking: how can we reduce the cost of these more fibre intensive types of network architectures and reduce the time it takes to build them but still get the nation built early and keep the cost down so we don't require any more debt or taxpayer money? If we find solutions, like we have with fibre to the curb—as you recall, there was very little mention of that in the early plans a few years ago. Now we are putting fibre to the curb on a million homes, which is replacing some of the HFC and a lot of the planned FTTN circuits. They are now going to go on FTTC. We are always looking. I've thrown the gauntlet down to challenge the team: can we double that? Can we get two million homes on FTTC without changing the price and economics and which keeps the build in accordance with our current schedule? NBN has factored that into its planning for the future rollout. When we [the Department] look at their corporate plan [for 2018] and how they anticipate that they'll meet the request from the government to be able to upgrade the network over time, it incorporates consideration of what technologies they would use and the ability to transition to those technologies over time. 2.74 With respect to the feasibility of upgrading premises already identified to receive FTTN to instead receive FTTC, Mr Morrow outlined considerations such as additional cost, loss of revenue and delay in deployment. Economics, until we can find a way to get fibre to the curb even cheaper than we already have been able to reduce it and a faster deployment, even with the improvements that we've made in the speed of the deployment, and we're working towards that. Again, we have a challenge internal to NBN, saying, 'Let's bust through this and see if we can have more breakthroughs so we can put more fibre to the curb in the ground and still stay within the remit that the government has given us with the fastest and least cost and most upgradable path. I will say that, if in the future we find ways to improve speed and cost, you're going to see more fibre to the curb. I like the technology from what we've seen so far, but it's still early days. We should all be a little bit cautious that these distribution point units will be put in a footpath in a box in front of a house. We're going to do this in large quantities and we have to make sure that works properly. We're not completely out of the danger zone in terms of having the refinedness to ensure that it works carefully. 2.77 A number of witnesses and submissions drew comparisons between the rollout of the NBN and the installation of fibre networks in other countries. Chorus are a publicly listed company on the New Zealand stock exchange. We are an open access, wholesale-only broadband infrastructure provider. The ultra-fast broadband initiative is a pure fibre-to-the-home technology solution, which targets 75 per cent of population coverage by 2020. We are six years through a nine-year program and have completed 73 per cent of the build so far. The rural broadband initiative was about delivering broadband and mobile in rural New Zealand. That was completed in June 2016, and Chorus's involvement in that was expanding fibre-to-the-node coverage out to more than 95 per cent of the New Zealand population in rural areas. There are three or four really key points that we can see in the market. There is the demand for higher value capability plans. Right now, more than 90 per cent of new fibre connections are opting for 100 megabits per second or more. We do have one entry-level product that is a 30-megabit per second product, but now there are only two players in the market offering that. Pretty much the 100-megabit option is becoming the norm. It is now 56 per cent of our fibre base. We have also got residential gigabit banks, and there are about 13½ thousand gigabit connections in the country as well. This is being driven by demand in a highly competitive retail market. The fibre is actually at the same entry level price now as a basic copper connection and ADSL connection, so that is really helping to drive demand. [The] key thing about the New Zealand approach is that Chorus [the wholesaler] actually goes into homes and does the connection right into the home. Chorus connects everything in the home to the system before it hands it over to the retail service provider. 2.81 It was brought to the committee's attention on a number of occasions that Australia's broadband speed performance is currently 54th in the world, and has continued to fall since 2013. The challenges around the world are very different typically to that in Australia. I have heard the committee's discussion around the fact that New Zealand fits into Australia 29 times or thereabouts, and that is quite relevant when it comes to rolling out a ubiquitous, fast network right across the nation. But it is not just that; it is also about population density. If you look at some of the other countries around the world to which Australia tends to be compared and look at the population density—people per square kilometre—you see that in Singapore there are 7,800 people per square kilometre; in Hong Kong it is just under 7,000; in South Korea it is more than 500; in Japan it is 350; in the USA is at 35; and in New Zealand, which we talk about a lot, the population density is 17. In Australia, it is a touch over three people per square kilometre. So here we are, a country the size of the USA with a very, very low population density trying to run a ubiquitous high-speed network and expecting it to create a commercial return. That is an incredible challenge. Probably the only other Western developed economy that has a population density analogous to Australia is Canada, where it is 3.7 people per square kilometre. The Canadian experience in terms of where we are up to in broadband rollout for high-speed services is pretty similar to Australia's. The regulator there had a target of a minimum of 25 megabits per second downloads for 90 per cent of the population by the end of last year. They have recently revised that to a target of 50 down and 10 up by 2021. So you can see that in countries that share the same geographical challenges as us we are not miles away from their experience. Of course, Canada have taken a different route in terms of funding the broadband rollout there. They have recently announced a $750 million fund to improve services in remote communities, where they have some of the same sorts of challenges as Australia. 2.85 As specified in the Statement of Expectations, nbn is tasked with rolling out the NBN to 'provide peak wholesale download data rates (and proportionate upload rates) of at least 25 megabits per second to all premises, and at least 50 megabits per second to 90 per cent of fixed line premises as soon as possible'. 2.86 Evidence provided by nbn through the Senate Estimates process suggests this expectation is not being met, and on current indications there will be 15 per cent of households with fixed line NBN who will only receive 50 megabits per second or less. 2.87 The NBN is being rolled out ahead of schedule. nbn, in its Corporate Plan 2017, projected that by 30 June 2017, 5.4 million premises would be RFS and there would be 2.3 million activated premises. As reported in the Full year results 2017, these projections have been exceeded: 5.713 million premises are RFS and there are 2.4 million activated premises. There are approximately 100, 000 new premises RFS each week. 2.88 The committee notes the Statement of Expectations requires that an upgrade pathway be available. Evidence to the inquiry indicates that nbn is cognisant of the need for upgrade pathways, but regards such upgrades as being dependent on market conditions rather than a matter of fundamental infrastructure quality, and has made no specific provision in terms of planning or funding for any such upgrade. 2.89 All the evidence strongly suggests that speed and data requirements of Australian households and business will continue to grow rapidly. While nbn has outlined the framework they are working from to be able to deliver an upgrade as the market demands it, this 'user pays' approach runs the risk of creating a digital divide in which low socioeconomic areas with poor NBN are not upgraded because the demand and matching revenue will not meet the nbn upgrade model. As it stands, Australia will not be provided with a fast, affordable, ubiquitous, and fair broadband network. 2.90 The committee notes that much of the FTTN network will likely need to be substantially upgraded in the short term, and nbn has made it clear this will more costly than delivering a future-proofed technology (FTTC or FTTP) in the rollout phase. 2.91 The committee recommends that the Australian Government direct and enable nbn to complete as much as possible of the remaining fixed line network using FTTC at a minimum (or FTTP), and require nbn to produce a costed plan and timetable under which that would be achieved. 2.92 The committee recommends, in light of recent results and developments, that the Australian Government commission an independent audit and assessment of the long-term assumptions underpinning nbn's financial projections and business case as set out in the Corporate Plan 2018-21. 2.93 The committee notes the Statement of Expectations requires nbn to engage proactively with those in regional and remote Australia, who have historically been at access disadvantage. The committee also notes that the NBN is designed to bridge the digital divide and deliver economic and social benefits for all Australians. Evidence provided through the submission and public hearing process suggests that regional and remote communities are amongst the least satisfied and most frustrated with their NBN experience, citing: changing technology mixes and rollout timeframes, missed and cancelled appointments, and lack of clarity of responsibility between RSPs and nbn. These factors are further compounded when geographic isolation means contractors are travelling hundreds of kilometres to address the same issue multiple times. 2.94 The committee recommends that the Australian Government direct nbn to establish a regional and remote reference group to support the rollout of the NBN in rural and remote Australia. The reference group would include consumer advocate groups and departmental representation from the Department of Communications and the Arts and the Department of Infrastructure and Regional Development. Business decisions that fundamentally change the nbn experience for the end user in regional and remote communities should be referred to the reference group for consideration and analysis as to whether the decision will result in nbn not meeting its responsibilities as outlined in the Statement of Expectations.